Food Market Hub Central Kitchen ERP is design with latest cloud and mobile technology to integrate every possible central kitchen process into one single system. It’s come with mobile ordering and automatically collect all order to central kitchen sales order. Not just this, central kitchen erp also can work with restaurant outlets to control purchasing from outlets that help outlets to do decentralizing process. 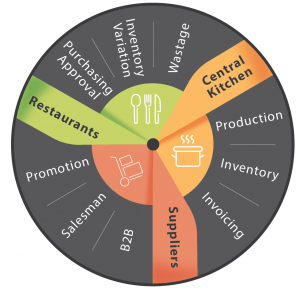 Food Market Hub is design to work for restaurant groups that having centralize purchasing and decentralize purchasing. Automatically convert all order from multi location to become work order at central kitchen, and reduce the raw ingredients required based on recipe module. Not just with this, Food Market Hub central kitchen come with barcode, FIFO picking mobile apps to auto notify user to pick older batch product, packaging, delivering, invoicing, stock movement, auto add price sales margin based on purchase price and multi central kitchen design. Food Market Hub is suitable for Restaurant Central Kitchen, OEM Central Kitchen, Canteen, Lumch Box Delivery Service. Call us today to understand more.